Felipe Massa won his third consecutive Turkish Grand Prix in Istanbul on Sunday, but it was not an easy victory for the charismatic little Brazilian, who was made to fight all the way by McLaren's Lewis Hamilton. It was not a great race but for the tense struggle between Hamilton and the Ferraris, but this was sufficient to keep attentive fans interested. The race began with a bang. Massa took the lead but Kimi Raikkonen was slow away. This meant that at the first corner the field was bunched up somewhat and suddenly cars were flying around. The first contact was made between Raikkonen and McLaren's Heikki Kovalainen, who had also made a poor start because the two men were on the dirty side of the track. This brush damaged Raikkonen's front wing and sent Heikki to the pits to have a slow puncture on his left rear fixed. He did not realise immediately because the race was neutralised almost immediately with a Safety Car, as a result of what happened behind them. Jarno Trulli was badly held up and behind him a bottle-neck developed until Giancarlo Fisichella arrived on the scene, going so fast that there was no hope of stopping in time. It was the end of an inglorious weekend for the Roman veteran, who flew into, and over, Kazuki Nakajima's Williams before crashing down in the tarmac with such violence that the car went no further. Nakajima went to the pits but there was too much damage to fix. Fisichella had begun the weekend in ridiculous fashion by driving through the red light at the end of the pitlane before the first session began on Friday morning. This meant he was given a three-place penalty on the grid, which effectively ruined any chance he might have had for a good race. He hoped to be able to pick up the pieces and calm the team in the race but crashing at the first corner definitely did the opposite. Fisichella tried to blame Sebastien Bourdais, who had complained loudly after Fisichella in qualifying, but the claim that Bourdais changed direction twice did not equate with the TV images. Whatever the case the Safety Car was sent out and the bashed and battered headed for the pits, including Sebastian Vettel, who picked up a puncture and Kovalainen who had a similar problem. "That was almost it for me," said Heikki. "Because of my heavy fuel load and the traffic it is extremely difficult to gain any places during the race." By the end of the race he had climbed only to 12th place. He fought his way back from the rear of the field and enjoyed a couple of good dices with the feisty Timo Glock. Heikki pulled off a lovely passing move on Glock, round the outside in Turn 11, but the German responded with an elegant move to take the place again before the end of the lap. Kovalainen got better traction and so was able to go ahead again on the straight. With Kovalainen out of the way and Raikkonen hobbled (but still able to set fastest lap despite a damaged front wing) the fight concentrated on Massa and Hamilton. Raikkonen hung on as best he could. The tyre choice was again important and with the Ferraris on soft tyres and everyone else on hard rubber it was an unusual fight. Hamilton stayed on the harder rubber until the final stint and was happy that he did because the car was not good on the softer tyres. 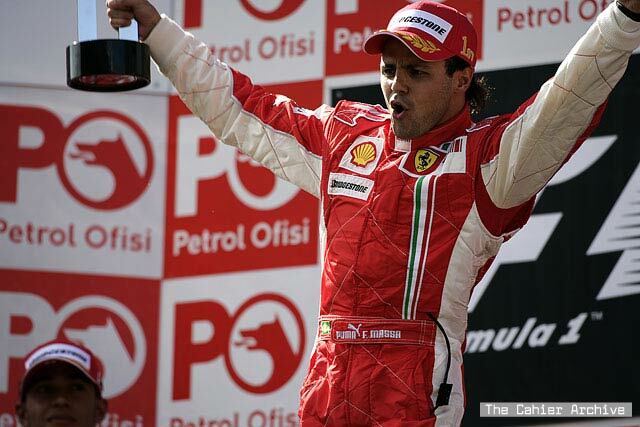 Nonetheless he beat Raikkonen and closed the gap in the World Championship. Hamilton's race was ultimately ruined by tyres. Last year he drove a wonderful race only to suffer a tyre failure. Hamilton went into the race expecting to do no better than fifth because of his hard tyres and a small fuel load but he ended up second and was delighted. In fact it was better than that because in the mid-race Lewis was able to get into the lead thanks to a delightful move on Massa. "I saw Lewis coming down the inside so I didn't risk going even more to the left because maybe we could crash," Massa said. "I tried to brake a little late but when he kept trying and kept coming I said, 'Okay, let him go and we see in the next stop how it's going to be.'" "It was a very difficult race. Lewis was pushing me hard the whole way, but I thought he was very light to begin with. When I did my first refuelling stop he was straight away there so I knew he was light, and the team told me straight away that he was on three stops, so that was a little bit of help because he was very strong when he passed me. But I knew I still had a big chance to win the race. All I had to do was to create a reasonable gap to be in the front after my pit stops." Despite this Hamilton reckoned this was a special race. The decision taken to go for a three-stop race was made on Saturday when Bridgestone expressed concern over the excessive heat build-up on Lewis's front tyres. Hamilton works his tyres harder than team-mate Heikki Kovalainen, hence the enforced decision to run him lighter on fuel and the cause for Lewis to be disappointed on Saturday afternoon when, in a lighter car, he had failed to take the pole position that he really needed to make the strategy work. "I'm thrilled to come second with the strategy we were on," he said. "Starting today on the harder compound tyre we knew it would be very tough to challenge the Ferraris and that a finish in the top five would have been good. But the balance of car on those tyres was good and I was able to keep pushing and pushing. The three stop thing won't happen anywhere else. We knew that even if we had got the pole we weren't really going to be in line for the win, so for me this was probably the best race I've ever done. Last year's failure was in the back of my mind and I was always checking the tyre on turn in to Turn Eight. I was just making sure I could report to the team if necessary and come in. "In the end you ask yourself and the team whether you could have done a better job and I strongly feel that I couldn't have. If not perfect, then I just feel that my race pace is getting stronger and stronger. Following a strong showing in Barcelona it was even stronger here. And we overtook a Ferrari! I feel we did a fantastic job as a team to bring it home second and to split the Ferraris." Raikkonen tried to fight but found his second set of soft tyres did not work well. He had to settle for third. Behind him it was pretty much business as usual with BMW Saubers of Robert Kubica and Nick Heidfeld fourth and fifth. Kubica made a great start but then Raikkonen was able to get ahead by running two laps longer before their first stops. Heidfeld had a good first lap and moved up thanks to his strategy. "I was then a little bit slower than the three guys in front of me, but quicker than the rest of the pack," said Kubica. "This was the maximum possible for me today." "This is what I hoped for from ninth on the grid," Heidfeld said. "To finish fifth was the best I could achieve today. I wanted to overtake Trulli at the start and this worked, then I gained two more positions during the pit stops. After the first stint I had a pretty lonely race and in the end I was even able to reduce the engine revs." "The car was well balanced and there were no problems with the tyres, so I am happy." he said. Not so Nelson Piquet who struggled all day and finished a poor 15th. The final points fell to Mark Webber after another solid performance for Red Bull, and to Nico Rosberg who was eighth for Williams. "It wasn't the most exciting race," said Webber, "I was just trying to hold on to Fernando, which wasn't easy as he was a bit too strong for us today. It would have been nice to be able to fight him a little bit more. I was cruising a little in the last stint, as Rosberg wasn't a threat. Getting more points is good for the team." Nico said he could do no more than he had done. David Coulthard and Jarno Trulli were the last unlapped runners, but went home pointless. "I just missed out today, which is frustrating," Coulthard said. "I raced as hard as I could. I think the strategy guys did a good job today, I just wasn't able to eke the last little bit of pace out of the car." Trulli was disappointed at the first corner when he lost three places and could do nothing to win them back. His Toyota team-mate Timo Glock showed his fighting spirit in style but a one-stop strategy meant that he was in traffic a great deal. Jenson Button was lapped in 11th mainly because of a brake problem which meant he was changed to a one-stop strategy that did not really gain anything. Rubens Barrichello finished 14th while those who cared continued to argue as to how many GPs he has done. Honda said 257, others said 255. Of the rest Vettel was delayed on the first lap but then got going and the had a refueling rig problem (as did team-mate Bourdais). Bourdais disappeared after just a few laps when something broke in the back of the car. After Fisichella's demise, his Force India team-mate Adrian Sutil, struggled with a damaged front wing. There have been better races but the tension was a good. McLaren is getting better. Perhaps at Monaco Lewis will end the run of Ferrari victories.